This week at our town's big celebration and parade, one parade entry will be the Hundred Hen March. 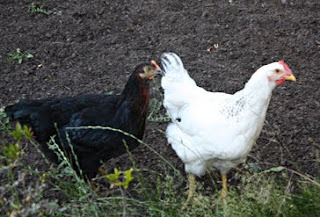 They may well have more than a hundred hens as it seems every other house in our area of town now has chickens. Asa is planning on going, towing a couple of hens along (caged of course) in our bike trailer. The purpose of the Hundred Hen March is to increase awareness of backyard chickens and the growing food sustainability movement. Sounds like a good cause and a fun time to me. I may have to make some kind of clever sign to march along with. What do you think of "Feeling Clucky Punk?" Okay, I Take It Back About the Snap Peas! You might remember I posted awhile back that my attempt to stagger my snap pea plantings looked to be a failure. As it turns out, it wasn't at all! My snap peas that I planted later have continued to produce as the first ones burnt out, with the result that I still have bunches of snap peas every day, and we're eating fresh veggies from the garden like I had hoped. In past years, we've just had a burst of snap peas and then they were gone, but this year the staggered plantings worked like magic and we've got a sustained harvest that so far is not letting up. I love it when things go right! 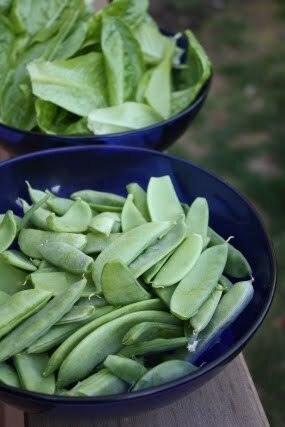 Since my kids really love raw veggies and aren't so keen on canned or preserved stuff, it's one of my goals to move towards a year-round harvest. This means staggering how I plant things, and using our sun room and cold frames to try and extend the season as much as I can. I'm still learning as I go, but I count this as a victory along the way. I'd consider my new bike commute as a report card on how well our city accomodates bicycles. I'm working at a new job, teaching kickboxing at our karate dojo which is in the next town over, about 11 miles from here. 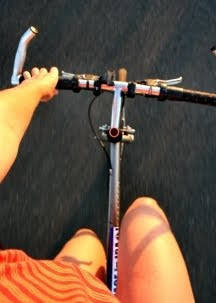 So far I've been commuting by bike most days. It's really a terrific commute, which takes about 45 minutes each way on my around-town commuter bike. There is not a single block of the journey that I'm on a street without some sort of cycling accomodation, which is very encouraging as a bike commuter. 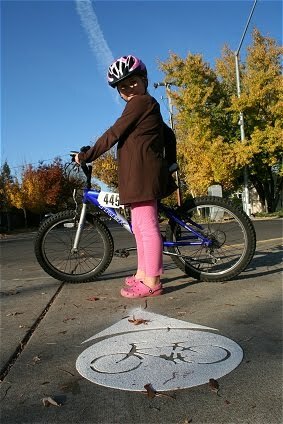 First, I start out on a street that's marked as a bike-friendly street. Around town they're delineated by green destination signs and these painted symbols on the street. They're generally low-traffic streets in which biking is encouraged and driving discouraged. In some cases, they have restricted entry to cars or speed bumps to discourage through-travel by cars. After three miles on that street, I enter the riverfront bike path. 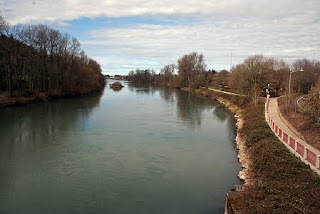 Most of my commute is along this path, which winds along the Willamette river for miles on either side. This path connects the two cities of Eugene and Springfield. Five miles down the bike path, I turn north onto a series of low-traffic streets with designated bike lanes. A new roundabout on one of the streets has a terrific bike accommodation to make it safer for cyclists. 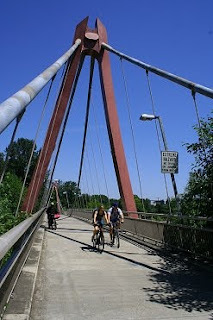 Eventually I end up on a new bike path that parallels I-5, and crossing over the freeway on a new cycling-only suspension bridge. This is one of two bike-and-pedestrian-only bridges that I cross on my commute. Our city has invested heavily in making sure cyclists and pedestrians can cross rivers and freeways easily and safely, and this makes my commute much more enjoyable. The last part of my commute is about one mile on a high traffic street. It's the least enjoyable bit of the whole trip, but I have a good bike lane to travel in, and all of the drivers so far have been exceedingly courteous, yielding to me even when they have the right of way. All in all, you can see how over the years the accommodations that my city has put into place to make cycling safer, easier, and more convenient have all added up to make it possible for me to commute to my job by bike. All of these changes did not occur overnight, or even in the same decade. It might be a bike lane here, a path there, a bridge here, a traffic change there. But when a city commits to making cycling a priority, you eventually end up with a network of paths, lanes, and streets that make commuting by bike an option that more and more people will choose. And that's to all of our benefit.